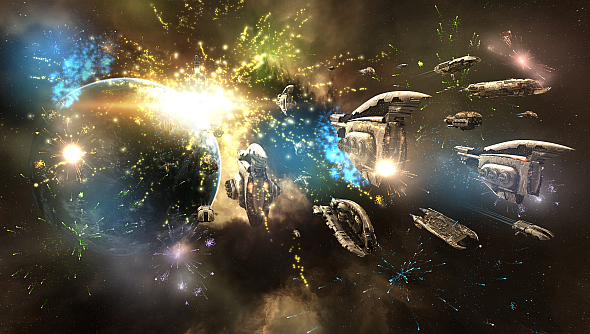 To celebrate 10 years of EVE, CCP are selling a collector’s edition of the game. You might wonder why you’d want such a thing – it’s a digital game, after all, with all the potential buyers likely already in possession of at least one account – but then you see what the box contains: another game. Yes, CCP have finally issued a new run of their board game Hættuspil. The thing’s taken on a near-mythic quality among EVE players because it’s only available in Icelandic, in Iceland, and because the cover features Reykjavik’s mayor dressed in drag. CCP developed Hættuspil back in the 90s as a way to raise funds to develop EVE. Since then it’s not been reprinted nor translated, so if you wanted a part of CCP’s history you had learn Icelandic and make a somewhat sizable investment. For the collector’s edition of EVE, CCP have translated Hættuspil and reworked all the game’s artwork replacing the photos of models with members of the CCP team. They even got Reykjavik’s mayor, Jon Gnarr, to come back and reshoot the iconic image of himself in drag for the cover. The collector’s edition should be available to buy in the store now – though it’s only just been announced, so it may be a wee while till the page is updated. When it does appear, you’ll see that it’s on sale for $149.99. So this may not be the cheapest way to get Hættuspil. If you pre-order the collector’s edition you also got a unique item for EVE and DUST. For EVE you get a destroyer which sounded like it was called a Nefnatar Thrasher(?!? ), and for DUST you get something called an Amarr uplink.